Title 28, section 1331 of the United States Code provides the jurisdictional grounding for the majority of cases heard in the federal courts, yet it is not well understood. The predominant view holds that section 1331 doctrine both lacks a focus upon congressional intent and is internally inconsistent. I seek to counter both these assumptions by re-contextualizing the Court’s section 1331 jurisprudence in terms of the contemporary judicial usage of “right” (i.e., clear, mandatory obligations capable of judicial enforcement) and cause of action (i.e., permission to vindicate a right in court). In conducting this reinterpretation, I argue that section 1331 jurisdiction is best understood as a function of the federal right and cause of action plaintiff asserts. Under my view, these two concepts, when weighed against each other, offer strong evidence of congressional intent to vest the federal courts with jurisdiction and form the foundational elements for the federal question jurisdictional analysis. This principle underlies three standards which offer both a better explanation of the Court’s past section 1331 cases and better guides for future decisions than the Holmes test. Under the first standard, section 1331 jurisdiction lies when a plaintiff makes an assertion of a non-judicially created federal cause of action and a mere “colorable” assertion to a federal right. 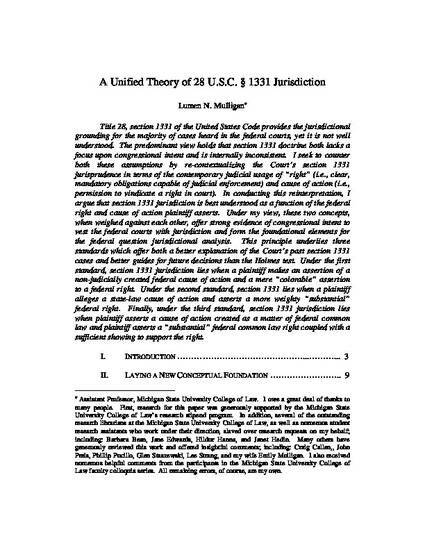 Under the second standard, section 1331 lies when a plaintiff alleges a state-law cause of action and asserts a more weighty “substantial” federal right. Finally, under the third standard, section 1331 jurisdiction lies when plaintiff asserts a cause of action created as a matter of federal common law and plaintiff asserts a “substantial” federal common law right coupled with a sufficient showing to support the right.